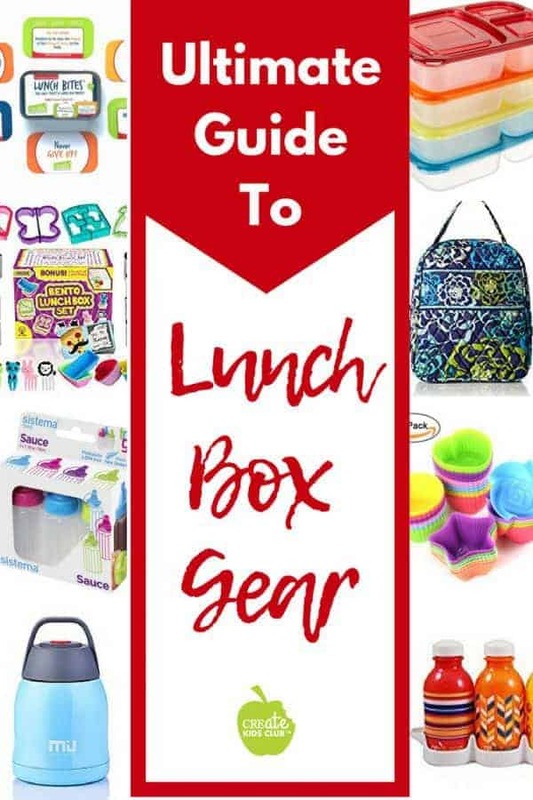 This is a complete guide for all things that are needed for school lunch, from lunchboxes to storage containers and accessories, this lunch box gear guide will help you get delicious lunches packed easily this school year. There are affiliate links found on this page. This means that if you were to purchase something through a link, I would get a small commission – it does not cost you any more. Thank you for supporting Create Kids Club! After talking with other parents, I have found a common theme. Not many like packing school lunches. Don’t get me wrong – many of us start with all kinds of ambition and excitement going into the year. Then reality hits and it’s not quite as much fun. 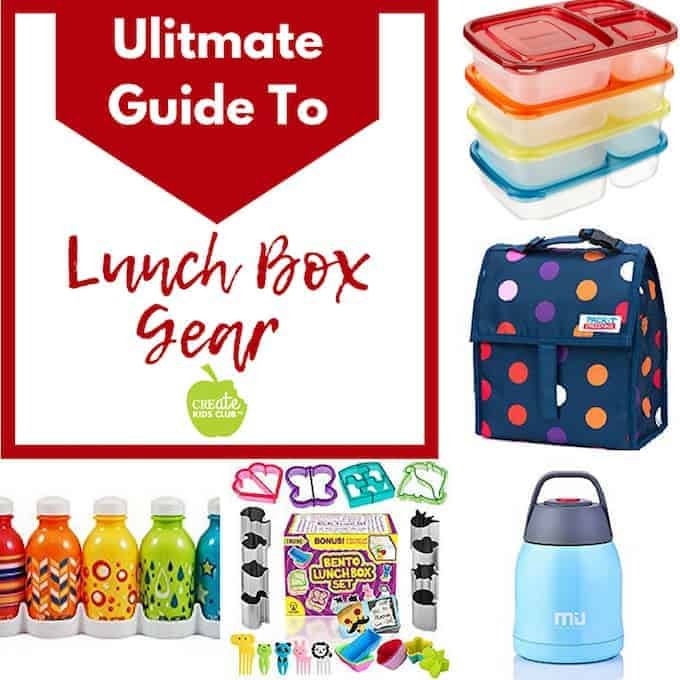 At Create Kids Club, I offer lots of healthy school lunch ideas, but today I am going to show you all the cool lunch box gear on the market that makes packing those lunch boxes so much easier. With the right containers and accessories in your kitchen arsenal, you will be ready to tackle this year’s school lunch easier than ever before! When it comes to lunch box’s there are a few different styles to choose from. Here are our favorites divided by style. The classic lunchbox comes in many different shapes and styles. These are typically easy to clean, pack well, and hold up for the full school year. You can find all the following lunch bags online by clicking the links or photos. Wildkin Insulated Lunch Boxes are great for the younger crowd. This brand offers super cute designs and different sized lunch box options. Skip Hop Zoo just might be the cutest lunch boxes on the market. What little girl wouldn’t love this unicorn lunch box? Easy to clean with a mesh pocket inside. Fresh & Fit Kids is a great option for the tween and above crowd. With tons of room inside the bag and an external pocket on the outside, there is plenty of room to fit all the extras like utensils, phones, or ice packs. An extra bonus? They are BPA-free and PVC-free. Our personal favorite? PackIt Freezable Lunch Bags. These bags that come in a range of colors, patterns, and sizes are lined with a freezable gel that keeps items cold for up to 10 hours! We have purchased many of these bags and can vouch that they work! For those who want the simple metal lunch box, the Tin Box Company has many varieties to choose from. They not only work great for school lunch but to store toys or accessories! What is a bento box and why have they become so popular? Bento is a Japanese lunch box or a Japanese-style packed lunch including rice, fish or meat, eggs, vegetables, pickled foods, and sometimes fruit. Modern bento boxes offer a bit more variety, and some contain sandwiches, yogurts, salads, etc. These compartmentalized boxes make packing lunches a breeze – along with saving on baggies and cutting back on washing dishes. Kinsho makes a 6 compartment bento box that has everything you need to get started! Grab your set of 2! Bentgo has the best bento box for kids. This box is portioned for kids ages 3-7 years old, is durable, and is leak-proof along with drop proof! For a Bento Box Stainless Steel, Easy Togo offers a leak-proof silicone lining and 4 clasps to keep a tight fit on your bento box. For a traditional bento box, Skater offers a stackable double lunch box with a band and a lunch bag. It even comes with a rice ball press! If it’s a glass bento box you’re looking for, Hello Meal Prep has a set of 5 that will get you through the year. These containers have 3 compartments with reusable sauce containers and labels. Dishwasher safe for the win! Check out the fun bento box covers that Bentology offers like the one shown above. For the older girls, lunch bags by Vera Bradley are popular. With a large inside space and pocket for ice packs, they sure are pretty! Need a lunch box cooler style? These bags are perfect for older kids who have sports practice after school and need to carry lots of food with them through the day. Just want paper lunch bags? Check out these fun disposable lunch bags from Fun Express! Containers for lunch boxes are very important for packing quick lunches. Having the right sizes that fit into the lunch box is key. Also, having enough that you’re not trying to handwash those from the day before in the morning is a benefit too! Fit & Fresh offers a set of 6 containers with lids in different sizes and even includes snap-in icepacks! Rubbermaid offers a nice set that includes containers for snacks. This kit includes a container for a sandwich, snacks, and a side with a snap in ice pack. Our favorite? These Amazon Basics all in one lunch containers with dividers. Easy to store, easy to pack, and inexpensive to purchase. Insulated lunch containers make packing leftovers, soup, or other hot items warm for lunchtime! LunchBots offers a small insulated container that is great for younger kids or smaller serving sizes! Our favorite insulated container for the older crowd who needs larger serving sizes is the Miu color thermos. It’s vacuum sealed and can hold foods hot for up to 5 hours and keep cold foods cold for up to 12 hours! If you want to send milk, water, or juice from home, these drink containers from Sistema are perfect. Phthalate and BPA-free. For another fun beverage container option, check out this 5 pack from reduce. Leak free bottles that come with a handy refrigerator organization tray. No lunch box is complete without a love note from home. Kids from young to old will all smile after finding a note from mom. Our favorite lunch box notes that include jokes, fun facts, and even cooking ideas are Lunch Bites. Part of getting kids to choose and eat foods that are healthy is to make these foods look more fun and appetizing. Check out these ideas for helping make this an easy task! Upchefs combines all kinds of fun into a kit perfect for lunch boxes. We love these silicone snack containers and they are really fun to freeze smoothies or popsicles too! Squeeze bottles are handy for everything from salad dressings to dips. Dips make every veggie better! A plastic cutlery set cuts back on waste along with adding fun to lunch time as your child gets to put their silverware together – or can eat with chopsticks! These small lunchbox containers are great for dips, hummus, nuts, or raisins. Kids love the tiny size! We love the above-layered storage container that makes packing parfaits and oatmeal a breeze and works for cereal and milk too! Your little one will get a kick out of these eyes looking back at them! These food picks work with fruits, veggies, sandwiches! If animals are more of your child’s thing, this set of 36 food picks is sure to brighten their lunchbox! Packing school lunches just got easier. My kids love finding fun containers and lunch notes in their lunchboxes, I hope yours do too! If you enjoyed the post make sure to leave a comment and share with friends and family! Then follow me on social media! Grab school lunch ideas here!